My Little Heart, Ruthie is an inspirational book of heartache and anxiety, written in limerick and rhyme by Toni Jannotta and illustrated by Jennifer Mones. A heart (known as Ruthie) feels despondent, as she holds within her a very poor image of herself after being taunted when showcasing her talents. She feels so small that she retreats to the innermost, darkest part of her soul and hides. The day comes when Ruthie is ready to break, and she suddenly hears the voice of the wind (known as Clyde) which lifts and inspires her, showing Ruthie her true self, and that she is worth more to the world than she ever could have possibly imagined. The warmth and beauty unleashed is truly breathtaking. Presented alongside some of the most mesmerizing illustrations I have ever seen, My Little Heart, Ruthie is a book that will take you to a place you have never before travelled. Finding a soul which is at the lowest of all lows is heart-breaking, and you can almost feel Ruthie crumbling as you read her sorrow-filled words. The strength, which is freely given by the wind, is done so unselfishly, lovingly and fully, with the aim of pulling Ruthie back from the brink. Toni Jannotta’s cleverly written, emotional tale shows the highs and lows of an anxious mind and heart, as it reacts to the barbed words of the heartless who mercilessly laugh at Ruthie’s musical gift. Jennifer Mones’ imagery, which accompanies each part of the tale, carries just as much feeling as the words themselves, making for a perfect partnership. I was truly moved by what I read, and recommend My Little Heart, Ruthie to teens and adults who enjoy the beauty of linguistics in poetry, when crafted into a beautiful and emotional journey of a damaged soul. 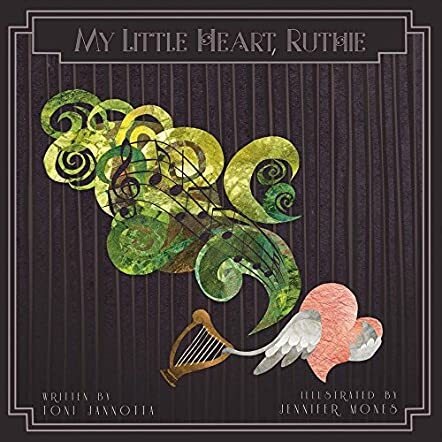 My Little Heart, Ruthie, written by Toni Jannotta and illustrated by Jennifer Mones, is told in rhyme and tells the story of a harpist whose heart has been hurt and abused by life, and she cowers away, afraid of being hurt again. She has a friend who is also a musician, Clyde, who eventually helps to persuade her to free herself from the prison she has made, and to let her music again bring joy not just to herself, but also to others. But even more significantly, the story shows the importance of healing and self-esteem. In this story, music is the healer. This is a very moving tale, told emotively and illustrated in an impressionistic way that pulls the whole story together and perfectly depicts the spiritual side of the journey that Ruthie is taking. Although described as a tale for children, it is perhaps more suited for an adult market, or certainly an older teen reader who is able to understand the meaning behind the story and relate to the deep emotion within the pages. There is an ethereal quality about the writing, enhanced by the rhyming, which really flows along gently and allows the pain and emotion to surface. The book is accompanied by a music CD which is sold separately to the book. On a practical note, the title could be more prominent on the front cover, but otherwise this is a piece of work that is thought-provoking and quite unique in its approach, and both the writer and the illustrator are to be congratulated. My Little Heart, Ruthie by Toni Jannotta is a children’s book on social issues that is told in rhyme. This is a book that would appeal most to a mixed audience of children, social workers, counselors, and psychologists. Ruthie is a heart and a classical harpist that has been emotionally wounded from abuse. Ruthie no longer wishes to go out and play due to feelings of self-loathing and blame. Slowly young Ruthie comes to understand how what was done to her was not, in fact, her fault and that she was an innocent victim of the harm done to her. As a psychology student interested in child psychology, I found My Little Heart, Ruthie by Toni Jannotta to be a wonderful book and resource for children who have suffered and are suffering from abuse. The book is written using easy to understand words that allow abused children to come to understand that they are not at fault in what happened to them; some children might need a little help in interpreting the meaning behind the rhymes, depending on their age and reading ability. The illustrations are beautifully done, but they are more beautiful than simply childlike; I feel that adding faces to the hearts would allow children to better sympathize with the hearts, as it would make them seem more like characters instead of abstract objects. Overall, I feel that this book could prove to be very useful in helping abused children come to understand that they are or were not responsible for the abuse that happened to them.